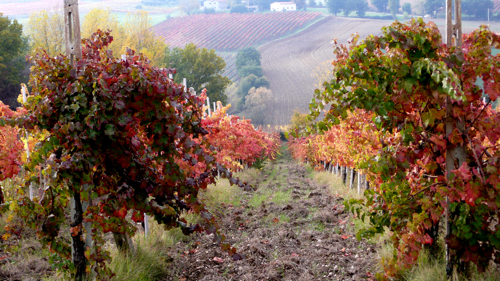 I love October in Umbria. Soon the winter sadness will descend on us, but right now colors are working full-time. Everywhere is golden and red. Everything seems to taste sweet, chestnuts, pears, grapes. There’s wonderful grapes everywhere. We are the lucky owners of a 1/2 century old vine-arbor. We don’t make wine with the fruits, too much of a fuss. We just leave the bunches there to capture the last bits of sun. During one of those mellow afternoons, I go outside to harvest them and enjoy the technicolor. I pick the best bunches, put them in a large bucket, sit comfortably with (dog) Google at my feet and remove all the stems. Then I pour the cleaned grapes in a cauldron and heat it until the grapes start bursting. I subsequently proceed to sieve the grapes through a mouli to remove skins and seeds. Next, I transfer the filtered grape juice back into the cauldron where I bring it to slow boil and let it simmer until is reduced by half. Finally I can make the jelly. For that, I use same amounts of sugar and reduced grape juice (weight), powdered pectin according to package instruction, the zest of 1/2 lemon, 2 cloves and 1 inch cinnamon stick per liter/quart grape juice. The whole process takes several hours. A small mountain of tiny wine grapes only yields a few precious jars. Every year I think I am crazy. Every year I hope I have captured some of the last sun in the jar. This jelly sounds like a delish alternative to vino! Wow… the flavor must be incredibly intense. Beautiful! I wish I can taste this my goodness this is an amazing jelly, I used to make grape jelly from my fathers grapevine every year, concord grapes. It was so fresh and the smell was heavenly I so miss those days! This brought back fabulous memories of him, thanks so much! Someday I hope to get some fresh grapes and make your recipe! Hi Claudia, do you remember the recipe? 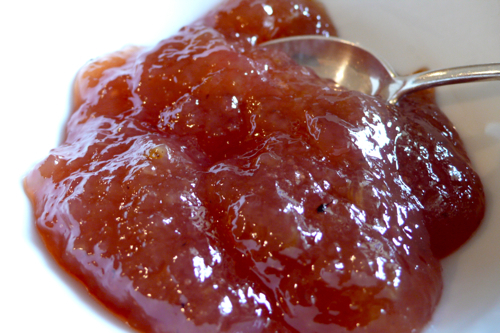 There are so few grape jelly recipes available, I would love to try another one! 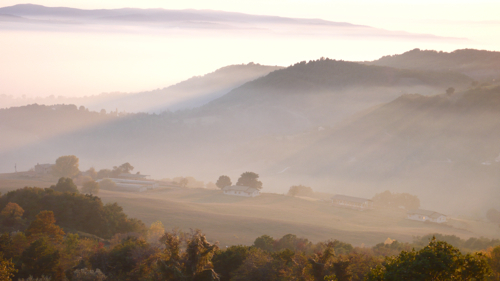 Your blog photos made me miss living in Umbria (Perugia to be exact!) Gorgeous views, mouth watering photos and recipes! Lovely. Grazie!! Thank you Rosemary, I love your work! Thank you Letizia FOr another look at the beauty of your world! Hi Romilly, I am glad you enjoy the juice steamer. It’s really great if one has to make large amounts of jellies from impossible fruit! Did you see my elderberry jelly? That’s also a though one! Persimmon is particularly difficult and bland when cooked alone. That’s why I mixt if with oranges and spices. That’s great to fill jam tarts like my crostata. Let me know how it goes. I will soon start with figs jam, they are almost ready on our trees. Your recipe looks great – how many kilos of grapes do you use for your recipe? Hi Tina, I generally pick 3-4 kg of grapes but, as explained in the recipe I only weight the juice to be able to add the other ingredients. It only yelds a few jars but it’s a fun process if you like to precess fruit as I do. Enjoy!